There was two pork loin steaks in the package I bought so I had to think of something to make with the other one as well. Many a moon ago I had dinner in a Cuban-esque seafood restaurant outside Boston, MA. That night I had griddled swordfish with a sweet potato and banana mash. Sweet potato and banana might not be a taste combination that attract you, give it a chance though. It is really good. I always make my normal potato mash really creamy but when it comes to sweet potato mash I prefer it to be a bit more firm. If you like it different, add some milk or creme fraiche to this base recipe. 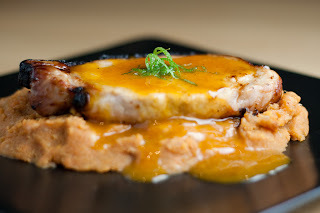 As for the pork, this orange and garlic marinade is something I use time after time. It is probably the best pork marinade I've ever tried. If you try this and still think that yours is better - let me have your recipe so I can try it. Pour all of the parts for the marinade into a plastic freezer bag, add the pork steaks - making sure to cover all of them. Marinade for a minimum of three hours. Once marinated, fish out the pork steaks and put to the side. Pour the liquid through a sieve into a pan, discard the solids. Bring the liquid to a boil and simmer until reduced to almost a syrup. When you think you have reduced it enough, give it some more time on the hob. Put to the side. Boil the sweet potato for about 8 - 10 minutes or until tender. Mash and stir in the banana. Add a good glug or two of maple syrup and season to taste. Grill the pork until done. Reheat the citrus reduction whilst grilling. Plate the mash, pop a steak on top and pour on some citrus reduction on each steak. Nice to find your blog. Your dishes are special, like your steaks. Banana mash sounds interesting. Yeah, banana mash is a bit different but it is a very nice side. Give it a go - hopefully you'll enjoy it! Just wanted to thank you for the pork marinade recipe - I've used it several times since you posted it and have never had better!! Many thanks for your kind words and I'm really happy to hear that you've found the recipe this useful. It's a very simple marinade, but I guess that is what makes it so good as well. I hope you'll continue to have use for it for a long time.